Arumana no Kiseki (アルマナの奇跡, Arumana no Kiseki? lit. "Miracle of Almana") is a 1987 platform game developed and published by Konami for the Famicom Disk System. It was only released in Japan. In the game's introduction, a magic red jewel known as the Almana is stolen from an unnamed village. A thief runs off with the jewel and turns the entire village into stone. The game's hero must track down the thief and recover the stolen jewel. The player takes the role of an unnamed hero who must travel through six cavernous levels in search of the lost jewel. The player begins with thirty throwing knives as his weapon of attack. As he ventures through the levels he can find various other weapons. These include: bombs, a handgun, boomerangs, a ball that destroys everything on screen, and a mace. He must destroy various cave dwelling creatures as well as henchmen, who sometimes drop these weapons. The hero's main source of transportation is unique. Besides just walking and jumping, like most platform games, he must also use a special grappling hook to reach platforms that are too high. To make things a little more difficult, the grappling hook can only be launched from a diagonal direction and not just straight above. 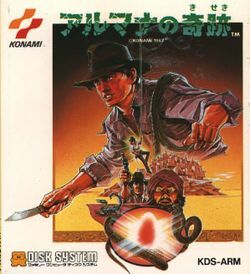 The game itself is very reminiscent to the Indiana Jones film series. The appearance of the game's protagonist is not only nearly identical to the adventurer, but the game's cave environments and plot, which revolves around the main character recovering an ancient treasure, are very similar to his explorations. The game also borrows heavily from an early Konami arcade game, Roc 'N Rope, with the main character firing ropes at platforms to cross wide chasms. This page was last edited on 5 November 2010, at 14:13.